If there is tapas made anywhere in London, it’s likely you’ll find me somewhere around some time soon. So after visiting one of the most fantastic exhibitions of the year, we went down to the woods and stumbled upon Rabbit on the way. Opened by three brothers who grew up on a farm in Sussex, the small restaurant makes for the most charming rural spot right in the middle of Chelsea (oh, the irony!). With its wood and stone walls, its subtle natural tones and its decidedly bucolic decoration, Rabbit offers a quiet retreat from the hustle and bustle of London’s metropolitan life. And how cool are those antic-tractor-seats-turned-chairs? They definitely give you a sense of that farm-to-table business rabbit is all about! Definitely not cool enough to divert my attention away from the food though! Especially when the mise-en-bouches look as good as those! Pretty-as-a-picture Beetroot Crisp, Goats Cheese and Blackberry Jam. Hake Rillettes which remind me of summer holiday picnics. And my favourite of all: the glorious Confit Rabbit and Tarragon on Parmesan Sablé. So good I could have eaten dozens of those. But it was a good call to keep some stomach space for one of Rabbit’s signature dishes: Chorizo and Labneh. Studded with crisp bread shards and incredibly morish kale crisps, it has almost nothing in common with the Spanish sausage dish but is equally delicious! The Lamb Chips disappear so quickly I barely had time to click a picture. Another of the restaurant’s signature dishes and an absolute must-order in my book (and I’m sure anyone else’s). The prettiest of all plates came in the form of a lot of cauliflower. Rainbow Cauliflower, Smoked Onions, Rocket and Almond Pesto. Just as delicious as it is pretty and the kind of dishes I hoped we’d see more of in restaurants. Another winner was the Duck Liver, Radicchio, Chives and Golden Grapes. Deeply umami and a game changer (see what I did there?)! The Wild Mushroom Ragu is a strong favourite amongst the restaurant’s patrons. 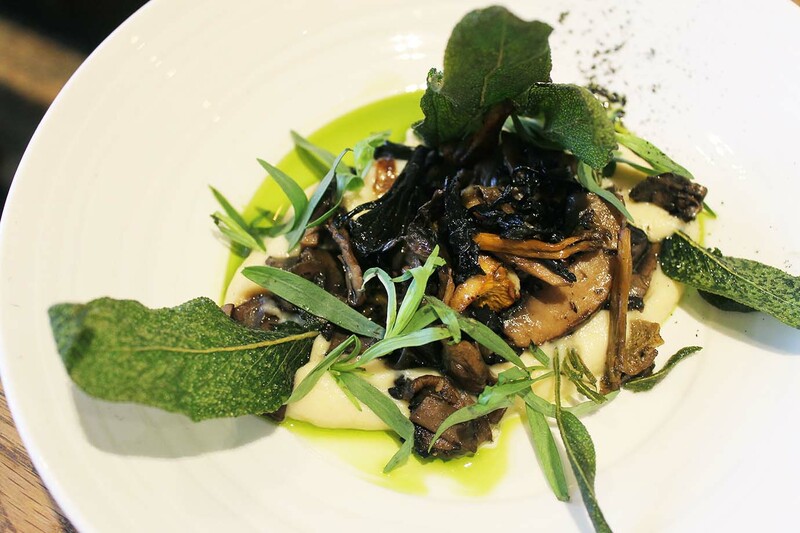 Crispy sage leaves, creamy celeriac mash and some of the best (and most truffled, in the good sense of the word) damn mushrooms I’ve ever had! I’m quite demanding when it comes to pudding, but I might just have found my new favourite. Honeycomb, dipped in chocolate and served atop dollops of vanilla mascarpone. Basically heaven in a mouthful and a combination I fully intend to re-use very soon! And all together quite representative of the food at Rabbit: simple, sophisticated and just right. Everything good food should be.